Canonburycreations: Addicted to Stamps BINGO! Metal (the topper), Free (the ribbon) and Flowers. The base card is A5 with the front folded back on itself. The metal topper is actually kitchen foil (did you guess?) folded in several layers and embossed in the cuttlebug. I can't get on with real metal, always end up cutting myself:) This technique works very well and is CHEAP! I matted it onto blue card and popped up on foam dots. I punched top and bottom and threaded organza ribbon through and attached a blue knot. The flowers are SU Botanical Blossoms ( a two step stamp ) stamped initially in grey versamark and overstamped with Bashful Blue. A little glitter at centre. Great idea to use kitchen foil - I always worry about sharp edges on the real metal. 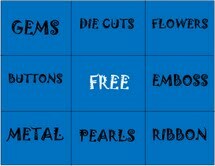 Great choice from the bingo card. Never has foil looked so attractive! It's a fantastic card! Well it beats wrapping a turkey in it ! Gorgeous Valerie it looks fabulous. Love the two step stamping such an elegant and pretty card with super texture. Valerie, amazing use of kitchen foil to create the topper. Such a pretty card you have created. Beautiful work Valerie! Nice working with the kitchen foil, I did it also once and I like it! Fabulous card, love what you did wityh the foil, it looks real expensive. 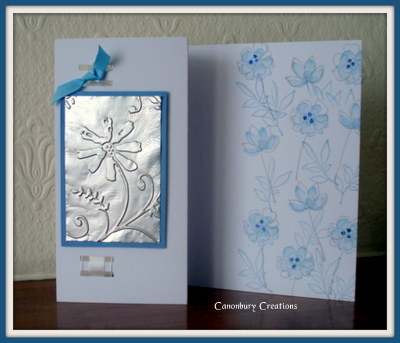 Really pretty card Val - love the two step flowers in grey and blue......so gentle and pretty.